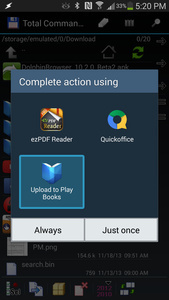 Earlier this month we reported that Google Play Books had been updated to allow for native uploading from your mobile device. Users with EPUB and PDF books were able to upload the files directly to your Books account, without needing to first send it to your computer and log in to the website like you had to do previously. When opening the book from your file manager or email, the new option reads "Upload to Play Books." The PDF uploading portion was always said to be experimental and indeed I had many issues with it when trying out the service. Clearly others did, as well, as Google has pulled the option for PDFs for the time being, leaving just EPUB. Google says the code should bring back PDF support in the future, but there is no timetable.